Three (3) 1929 TN $5 Brown Seal National Currency notes, depicting the portrait of President Abraham Lincoln. 1st item: $5 bank note dated 1929 from the American National Bank of Nashville, Tennessee. Serial # B067571A/ pp H. CH # 3032. Jones/Woods signatures. 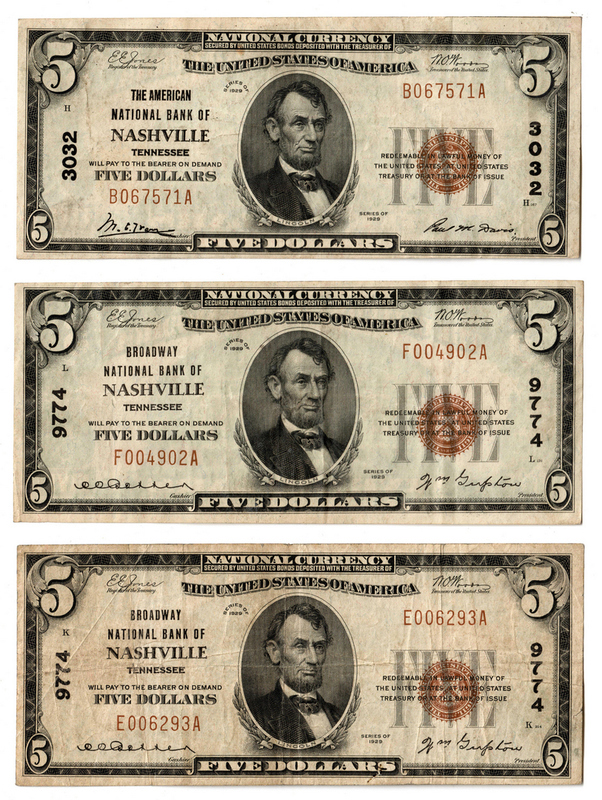 2nd-3rd items: Two (2) $5 bank notes dated 1929 from the Broadway National Bank of Nashville, Tennessee. Serial # F004902A/ pp L; E006293A/ pp K. CH # 9774. Both with Jones/Woods signatures. Provenance: the collection of the late James A. Newman (Nashville, TN, 1892-1964). CONDITION: 1st-3rd items: Very Fine condition.